Pakistan Muslim League-Nawaz (PML-N) supremo and jailed former prime minister Nawaz Sharif’s wife Kulsoom Nawaz on Friday opened her eyes as a sign of improvement in her deteriorating health, local media outlets reported citing sources privy to Sharif family. 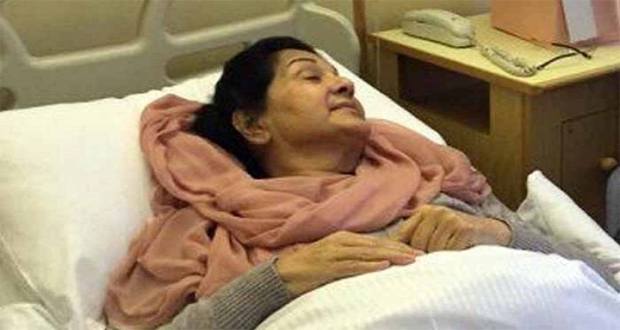 Earlier on July 24, Kulsoom’s son Hassan Nawaz had told a private media outlet about his mother’s health showing slight improvement with her vital signs being intact. Previously, according to Kulsoom’s daughter Maryam Nawaz, she had opened her eyes after remaining in coma for over a month. “Nawaz Sharif and I were with Begum Kulsoom Nawaz when she opened her eyes,” she had stated, appealing the nation to pray for her mother’s health. On July 13, Nawaz had stated that he is going to leave his wife in a critical condition before returning back to Pakistan to be arrested along with Maryam Nawaz by the National Accountability Bureau (NAB) after his conviction in the Avenfield apartments case. In the month of June, Nawaz Sharif had said that he wants to return to Pakistan at the earliest, however, he cannot leave behind his ailing wife who is fighting for her life. “Would it be appropriate for me to go back to Pakistan leaving my wife behind in suffering?” Nawaz had questioned. He had further said that he aspires to resume politics after his return but it would be ‘inappropriate’ to indulge in political discussions at a time when his wife is currently on a ventilator in a critical condition. Kulsoom Nawaz was diagnosed with throat cancer in 2017 after which she was admitted for treatment at London’s Harley clinic, where she is currently on a ventilator.